The code needed to run this example may be found in the gauss_example_ceres.py in the orbitdeterminator/kep_determination folder. There, a high-level interface for processing of multiple observations of MPC-formatted files is used in order to compute a preliminary orbit for Ceres, using 27 observations of this body. The example may be run from the command line simply by doing $ python gauss_example_ceres.py. The only caveat is that, as stated in the previous blog post, the computation relies on using the NASA-JPL DE 430 ephemeris for the Earth and the Sun in SPK format, so in order to run this example the de430t.bsp file must be present in the kep_determination folder. This file may be found at ssd.jpl.nasa.gov/pub/eph/planets/bsp/de430t.bsp and may be downloaded via FTP. We decided against uploading this file to the orbitdeterminator repo, since it’s around 100MB in size. After running a few preliminary code, the example calls the gauss_method_mpc function, which takes 27 ra/dec observations in total, separated by time intervals of around 1 month, in order to compute the orbit of Ceres. That is, this function read the whole MPC file for Ceres, reads from it only 27 lines, and from it then computes the Ceres orbit using the Gauss method taking three by three observations. We noticed that, if shorter intervals were taken, then the Gauss method showed some convergence problems. We also found that these problems with very short observational arcs for the Gauss method have been described, e.g., in . Below, we show the output from the gauss_method_mpc function. There, the Sun is shown as a yellow dot at the center of the plot. 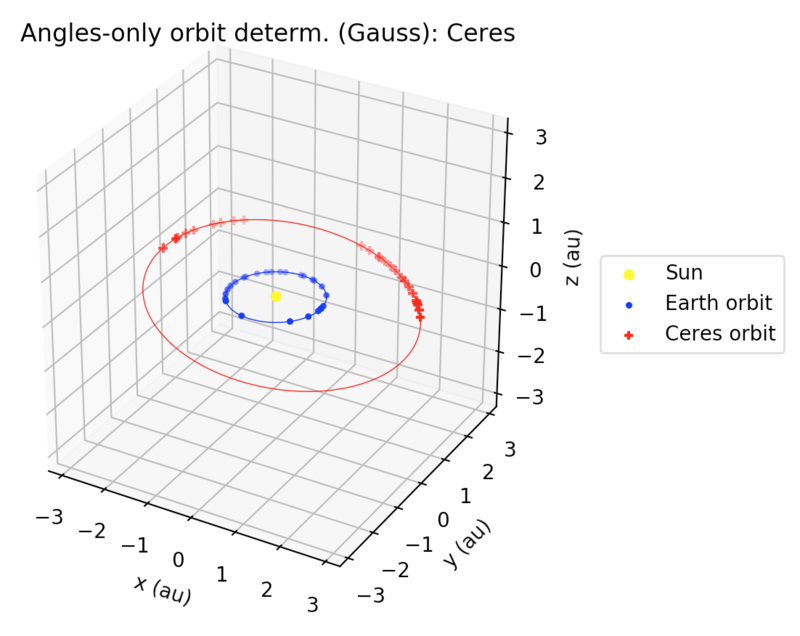 The computed orbit of Ceres is shown in red along with the estimated states using the Gauss method. Also, in blue, the orbit of the Earth is shown. Thus, we see that although some differences exist, our results give a very good first approximation to the orbit of Ceres, using only 27 observations! Indeed, Gauss method is really powerful! 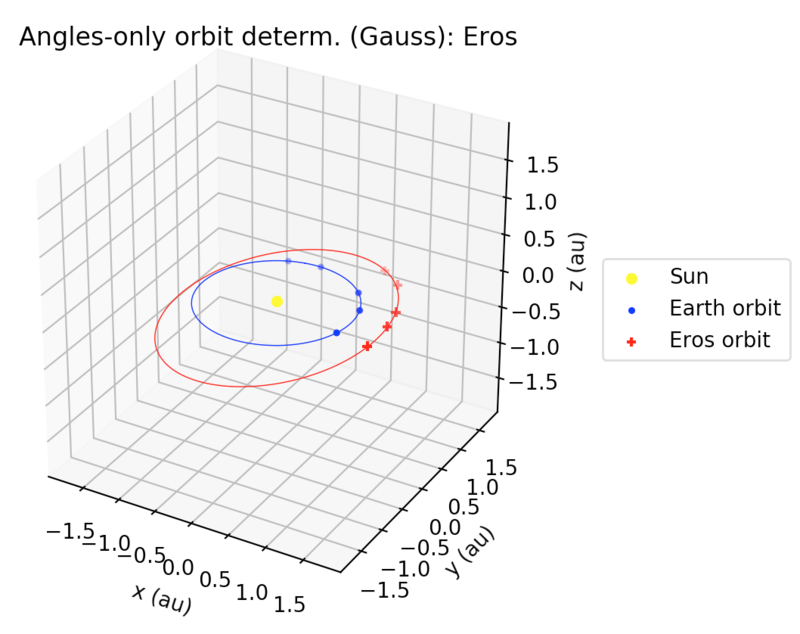 In this example we compute the orbit of the first-ever discovered Near-Earth asteroid: 433 Eros. Here, we use the Gauss method with only 4 ra/dec observations. Again, although we observe some small differences, the results we have are pretty close to the ones computed by JPL. And now, we used only 4 observations! Milani, A., Gronchi, G. F., Vitturi, M. D. M., & Knežević, Z. (2004). Orbit determination with very short arcs. I admissible regions. Celestial Mechanics and Dynamical Astronomy, 90(1-2), 57-85.